National Park Office, 101 Reserve St.
National Park - The first National Parks were in the USA and Hot Springs National Park was the first of these. One thousand acres of land were designated as protected landscape in 1832. Unlike British National Parks the land was owned by the State. The designation was seen as particularly important in that it protected the immediate catchment zone for the Hot Springs that were already being exploited as beneficial to health in the early 19th century. Malvern - gateway to the Hot Springs - the town of Malvern lies immediately outside the Hot Springs National Park and includes a railway station. It was here that many of the water curists first arrived for a stay to restore their health. It was also once an important brick making town. Today the town has lost its role as a centre for the spa industry and instead takes on the appearance of a ghost town, with empty shops and a railway that carries freight rather than wealthy visitors. An attractive museum records Malvern's history. The town is in the throes of major redevelopment as tourism becomes high on the agenda. 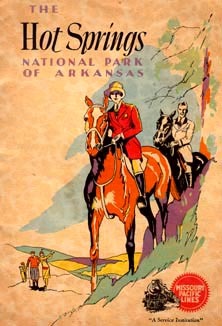 Hot Springs Resort - The National Park includes the resort of Hot Springs which during the 19th and 20th centuries thrived as a spa resort. Much of the infrastructure survives and spa treatments continue to be available. The principal concourse is Bath House Row where a series of Bath Houses were built in grand style for the water cure patients. These have been restored and now serve a variety of uses including a Visitor Centre, Heritage Museum, containing all the original accoutrements of an active bathing facility and as an active Modern Water Cure facility. The 47 Hot Springs - Like Malvern in the UK, Malvern USA has numerous springs, unlike Malvern UK however the springs are hot and soda/saline. The 'Valley of Vapours' was a revered and sacred place for the Native American Indians. The first explorer to discover this natural wonder was likely De Soto in 1541. As the European exploration and settlement of Arkansas took place the Indians were dislodged and a shanty town sprung up, providing very basic bathing facilities around the hot springs. The water flowing from the springs is believed to have been beneath the ground for some 4000 years and the combined outflow amounts to something like 850,000 gallons a day. 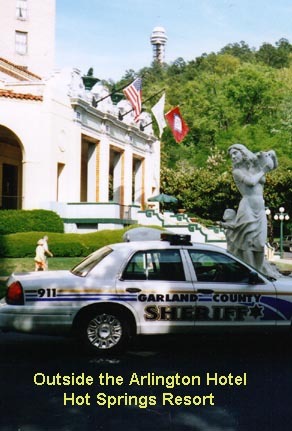 The average temperature of the water is 143 degrees F. Many of the springs are contained and the water directed to the historic bath houses. Others however continue to flow and can be seen along the Grand Promenade. Malvern Arkansas once had a thriving brick industry. Today the works has closed but the memory still lives on. 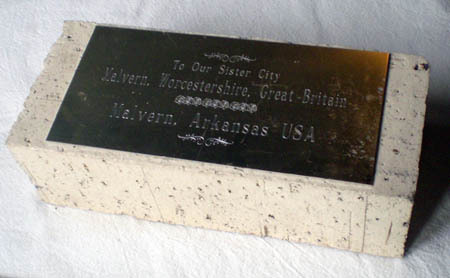 Below is a picture of a Malvern brick that was presented to Malvern England in the early 1990s. A treasured memento, it is still kept in a display cabinet in the entrance hall of the Council Offices in England. Picture right: A quarter dollar celebrating Hot Springs National Park.